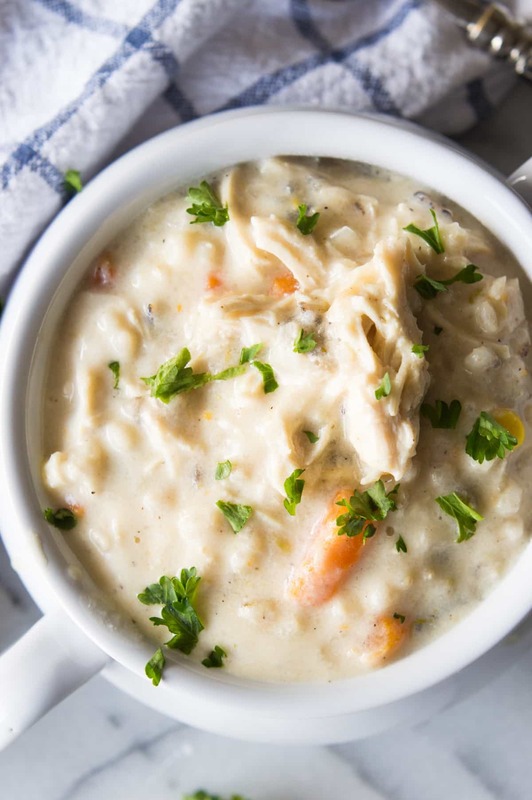 Slow Cooker (affiliate link) Creamy Chicken and Wild Rice Soup! This soup is ultra creamy, ultra flavorful, and best part? There’s no actual cream or butter used! This is the perfect lighter version of a classic comfort food. Welcome 2017. Did you have a wonderful New Years? Mine involved dinner with some friends, home by 7:30. A quick trip to the market to grab some allergy medicine for Little Miss whose poor little eyes were all red and puffy. Which happened to her dad too, so I blame him for passing on allergies to this poor little girl. Some takeout and a Netflix movie with the hubs rounded out our New Years Eve. Super exciting I know. But to be honest, it was wonderful and I loved it and I wouldn’t want to spend my holidays any other way or with any other people. With New Years comes resolutions. And I know for me and maybe some of you, a lot of those resolutions revolve around how many healthier meals will be cooked and eaten. A lot of times what makes it hard to eat healthier is how busy we end up. Work, kids, school, life. All of those things can get in the way of preparing a healthy home cooked meal. 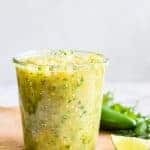 Luckily, this recipe is made easy with the use of the slow cooker (affiliate link) and the addition of frozen vegetables (saving us time from having to chop and dice). 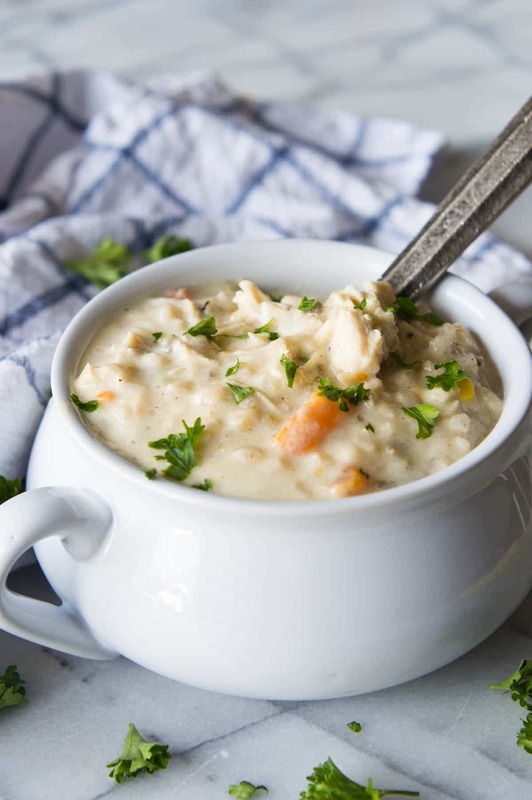 Plus it’s made healthier by leaving out the butter, flour, and heavy cream that typically comes with creamy soups. 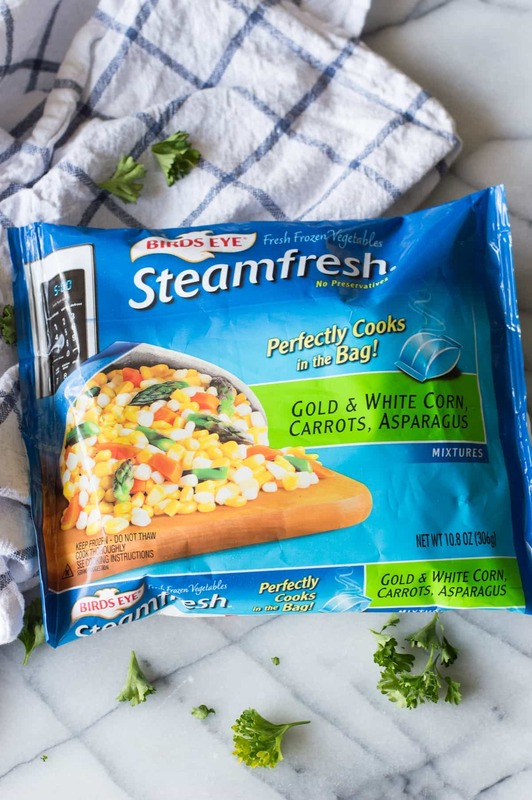 For this recipe I picked up these Birds Eye Fresh Frozen Vegetables from Kroger. The best part is that there are several varieties of vegetables to choose from. So you can dress this soup up however you like. I went with Gold & White Corn, Carrots and Asparagus. Using frozen foods when cooking can save time, help cut a few corners, and can just be a little more convenient. 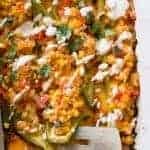 Make sure you click on over to www.freezerfreshideas.com to snag coupons, recipes and articles helping to balance home cooked meals with a lack of time. 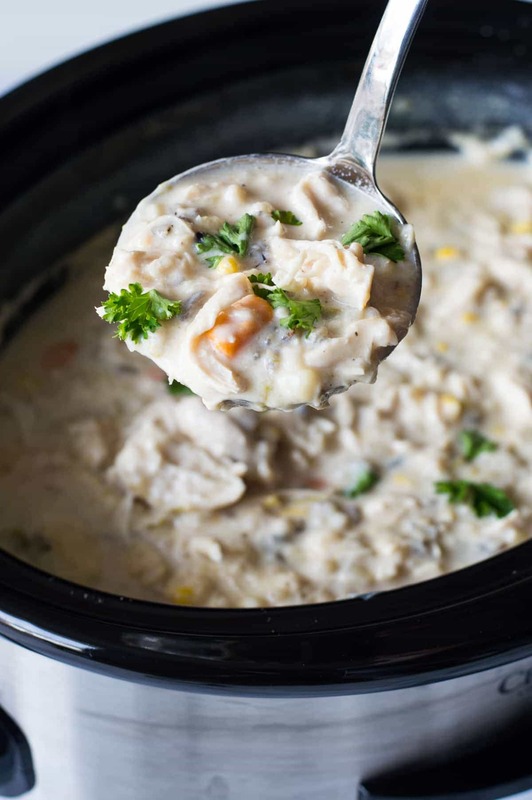 WANT TO TRY THIS SLOW COOKER CREAMY CHICKEN AND WILD RICE SOUP? 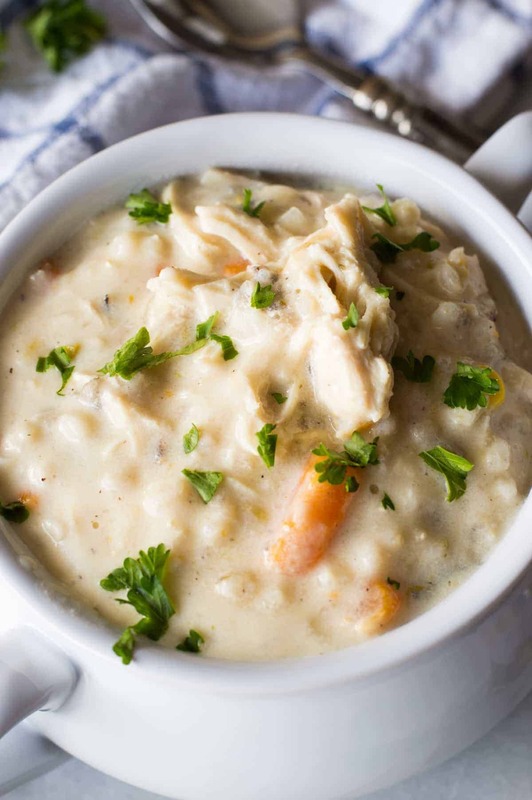 PIN IT to your DINNER, SOUP or SLOW COOKER (affiliate link) Board to SAVE FOR LATER! 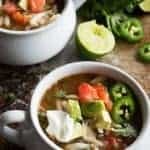 Place the chicken, frozen vegetables, diced onion, chicken broth, wild rice, and seasonings (salt, rosemary, bay leaves, and garlic powder) into the slow cooker (affiliate link). Cook on low heat for 7 hours or high heat for 3.5 hours. 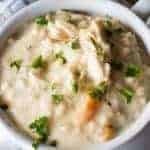 Remove the chicken from the slow cooker (affiliate link) and place on a plate, shred with two forks and add back to the slow cooker (affiliate link). In a small bowl combine the cornstarch and water, stir to combine until smooth and silky. 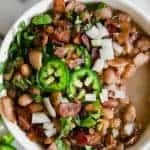 Add the cornstarch mixture and evaporated milk to the slow cooker (affiliate link). Continue cooking on high for an additional 30 minutes or low for an additional 40 minutes until soup is thick and creamy. Is no.2 directions incorrect by any chance? I’ve never known of cooking in the crock pot on high heat longer time than lower heat. Hi Linda! Yes, that was a typo. Thanks so much for reaching out! I have it corrected now. 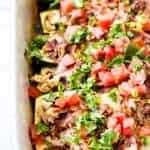 i don’t have a slow cooker can i use instead the old-fashioned way on the stove? Absolutely! It might be easiest to have the chicken pre-cooked and shredded then add to the soup. Then you should be able to make this soup in a fraction of the time on the stovetop.